What would you do if you discovered nothing was as you thought, and the fate of your friends, perhaps even the world was in your hands? 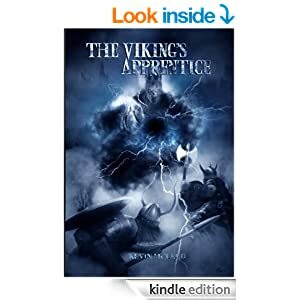 That’s the reality Peter must face in the middle Grade novel, The Viking’s Apprentice. Campbell’s Cove is a small town surrounded in mystery and intrigue. The history of the Cove tells us of dragons, trolls, goblins and the evil Master who stole children, livestock and, strangest of all, eggs from the Cove every year. Aided by the hideous monster, Tolldruck there seemed no stopping their evil plan. That was until, centuries ago, a Viking warrior came to Campbell’s Cove and vowed to rid it of all evil, and claim the prize offered by the mysterious church elders. The Viking succeeded and everything returned to normal. The evil was gone, and Campbell’s Cove was safe again… Until now. When Peter and George visit Peter’s Granddad’s amazing mansion in Campbell’s Cove for the summer holidays they had no idea it would change their lives forever. Deep beneath them in the caves of the Cove an evil has returned, an evil which threatens to destroy everything they believed to be true about the world. Peter must learn who he really is, and what he must do to save the children of the Cove. Together with George and his Granddad they go on a journey that reveals secrets, test friendships and confronts their biggest fears.